Once again, unfortunately this review contains spoilers for those who haven’t both read this book and read this far in The Darkest Powers trilogy by Kelley Armstrong. I’ve already read and reviewed The Summoning and the The Awakening. My name is Chloe Saunders. I’m fifteen, and I would love to be normal. But normal is one thing I’m not. For one thing, I’m having these feelings for a certain antisocial werewolf and his sw eet-tempered brother–who just happens to be a sorcerer–but, between you and me, I’m leaning toward the werewolf. Not normal. My friends and I are also on the run from an evil corporation that wants to get rid of us…permanently. Definitely not normal. And finally, I’m a genetically altered necromancer who can raise the dead, rotting corpses and all, without even trying. As far away from normal as it gets. If I didn’t know that there was another book following this trilogy, The Gathering, then I would say well that didn’t end very well did it? It felt unfinished, but with The Gathering coming out, even though I know it’s not following the same main character, I guess we’ll have to wait and see how unfinished this trilogy was (I’m starting to wonder now if all her books feel unfinished or if it’s just the ones I’ve read). I guess you could say I’m going backwards with sharing thoughts on the book, but the ending really bugged me because after being completely immersed in this story for two days (that’s how engrossing it was! 3 books in two days. I may need a break) the ending felt rushed and a little unsatisfactory because of it. It also didn’t help that the story started out particularly frustrating, especially with Simon and the adults that come along. First I feel there are three stages to Simon in the trilogy all the way up to the first 100-150 pages in The Reckoning. Book one: Playing the nice guy role. Has some potential to be a full-fledged character, but seems to give the nasty suspicion of a go between. Book Two: Jealous much? Trying to insinuate himself into a situation and get all chummy. Bleurgh. This makes more sense in the tail end of book three, but still when it comes to reading a character who is trying to get in on everything you start to wonder just how desperate that person is. No one likes being around desperation in normal life, why do we want to read it? Book Three: Annoying, just annoying. Interrupting all the time. Something starts to happen and Simon just happens to pop up! Is someone feeling left out is he? What a pain in the arse. For me he has gone from a go between character, to a one dimensional character, to a jealous character, and then the whole vying for Chloe’s attention drove me nuts. I wasn’t even past the 50 page mark before I decided I’d had absolutely enough of Simon and I wanted him to piss off. I don’t know about this ploy if it is a ploy and it must be a ploy. An unnecessary ploy that is grating. And the adults are so frustrating and annoying, especially Margaret (Chloe’s Instructor) who just won’t listen. It really bugs me in YA lit when adults come along and won’t listen. It happens too much and it drives me up the bloody wall. Why, does it feel as if the majority of adults in YA lit in particular have to be so oblivious (even if there’s a reason for it)? It does not make for interesting reading. It makes for frustrating reading! My annoyance and frustration meter was ramped up so much in the first 70 pages I was starting to question if I would enjoy any of this book at all. Bleurgh. Again. You know what I dislike about love stories? There’s always a pity party in there somewhere. At some point the character fucks up, even just a little, and then it’s all why me? Oh why me? Oh why am I such a screw up? No one loves me! Boo hoo, blah blah blah… and so on and so forth. So far it had been avoided for the most part in this story, but here it was in the last one. Hmm maybe that wasn’t such a good idea. Finishing the story with a bit if self-deprecation is never attractive because self-deprecation just isn’t attractive most of the time (unless you have a sense of humour and the right attitude to pull it off without people wanting to sock you one). That’s enough of my bitching though because even though I had a crazy level of frustration and it sounds like the book made me angry, well it didn’t really. Those problems just stuck out like sore thumbs and unfortunately lasted afterwards when it comes to thoughts of the book, but as a whole I did enjoy it. Not as much as the first two, but Simon’s one dimensionality isn’t really a big issue and he stops being so annoying further on, Tori even stops being a pain in the arse with the constant bickering (I like banter in stories, but bickering can be pretty painful), and I did have a major problem putting the book down. I read it in 6 hours. I usually try not to do that, but this time I couldn’t help myself. 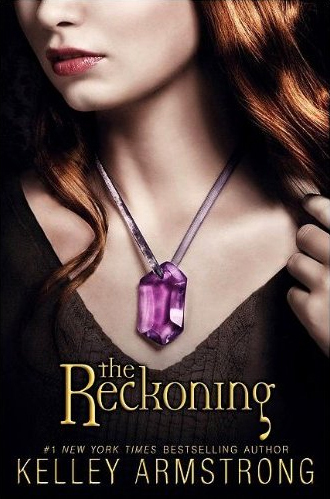 The ending, Simon, adult vs. adolescent interaction stereotypes, and a misleading title (The Reckoning? Really? Where was this reckoning? Death isn’t reckoning), just left a bad taste in my mouth, but on a whole, with the other two, it’s still engrossing.